Today I feel like discussing echinaceas at great length. 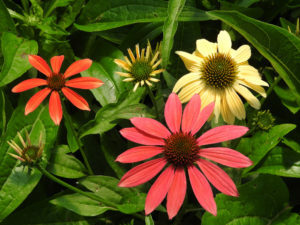 These are the coneflowers and there are many kinds with many Latin names to go with them. A person can go on the internet these days and learn many things about echinacea without understanding anything; which I have recently done. What I learned is how to spell e. purpurea, e. paradoxa, e. augustifolia, e. pallida, e. atrorubens, e. laevigata, e. simulata, and e. sanguinea and what I understand is very little. Many years ago I bought some E. tennesseenis seeds from Johnny’s Select Seeds, a mail order seed place and have been growing them ever since in one of my sandy fields. Back then the plant was endangered and thus it was legal to purchase the seeds, sow them, sell the plants, but illegal to plant the plants. Those days are over. The plant was a commercial failure because it looked scraggly in a pot, kind of thin and tall and weak. The blooms were a pleasant pink but not the shocking pink that sells plants to the hoi polloi. E. tennesseenis prefers poor gravelly or sandy soil as it does not compete with other plants when in rich soil. It is, strangely enough, heliotropic, or kind of heliotropic as it always faces the East. Technically, the word heliotropic means that something follows the light so there must be some other technical name for what this plant does. I liked its long bloom period. When I accidentally planted some next to a row of Caryopteris ‘Arthur Simmonds’ the light pink and purple blue color contrast was dramatic as well as a welcome color splash for August and September. We collect the seeds and have far more than we can ever sell. Pictured is a nice two-year old row in the field, over 400’ long. 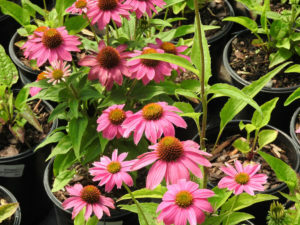 The Chicago Botanic Garden crossed Echinacea tennesseenis, e. augustifolia, and e. purpurea to get e. ‘Pixie Meadowbrite’PP# 18,546 which is a Chicagoland Grows® plant and thus one that we are licensed to propagate. We have lots of it in the field and so can make even more lots of it. 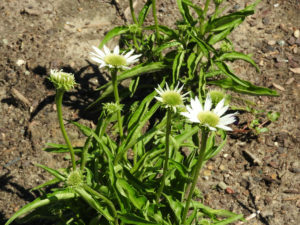 This plant was bred by Jim Ault who, in common with myself, has an undergraduate degree from the University of Michigan. We try to not make a big deal about this all of the time. This is a compact very even and very bright plant. 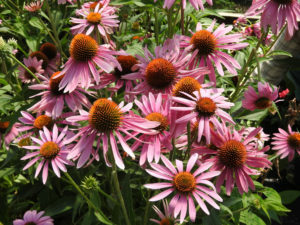 We are busily building up stock in the Intrinsic Gardens introduction: Echinacea ‘Snow Cone’ which is not patented, and I think it is because Brent was short of money that year and could not pay for the patent fees. His loss is our gain as this is a very nice white bloomer with the distinction being that the petals droop, and this makes the plant look good and not droopy. The photo does not show this characteristic; maybe it shows up later in the year or in maturity. There are many named varieties that are seed grown: ‘Pow Wow White’, ‘Pow Wow Wild Berry’, and ‘Cheyenne Spirit’. 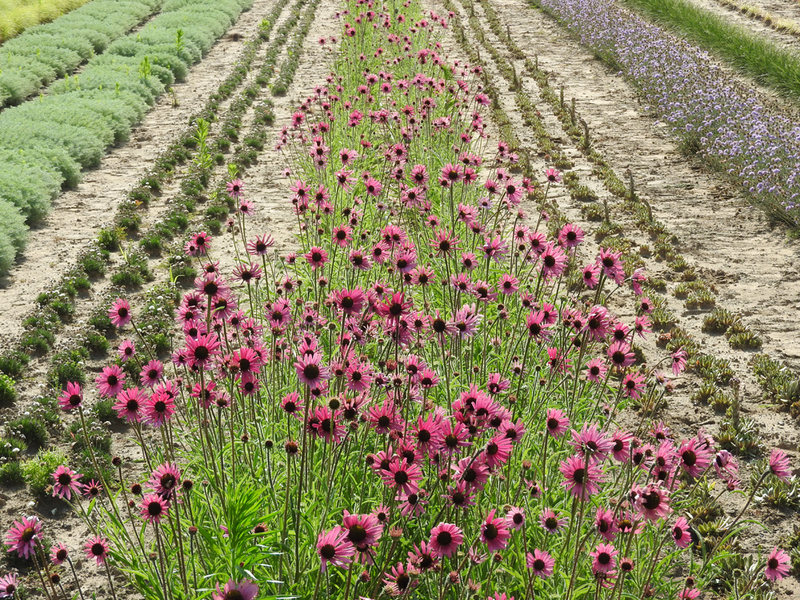 The latter is a Ball Seed introduction and a really nice collection of bright echinacea-like colors. 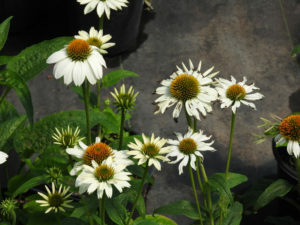 Some of these Echinacea (both patented and seed grown) plants are really tall, and thus even more splashy than normal. They do not ship good when tall and in full bloom in the middle of summer, which is a little awkward as that is the time to sell them. We are working on this problem. If the customer would order them recently cut back then we could ship twice as many on a truck and they will be all neat looking when they arrive and then the customer can worry for a full twelve months about our ethics in sending out plants properly labelled and true to name. We would tell you that we try really hard to do the right thing, except, that when a person comes up to you with a happy look on their face and an outstretched hand with the first words out of their mouth being “I am an honest person” the recipient of this greeting often wonders why that subject was brought up in the first place.